Federica Schiavo Gallery is delighted to present Obenauf, the first solo show by German painter Clara Brörmann in Italy. The works in the exhibition, all painted in 2013 and 2014, offer the viewer a chance to trace the paintings’ process of formation. 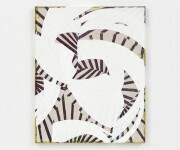 Clara Brörmann uses oil paint and adhesive tape on her canvases; in intermediate steps, the support is rubbed, washed off or sanded several times. During the genesis of the painting, the emphasized materiality of layers results in a temporally condensed piece. In the five artworks on display from the Kopfbilder series, the changing relationships and the interaction of two canvases become the focus of attention. Clara Brörmann’s works are made of two different parts. By mounting the smaller part above the larger one, the impression of head and body is given, which is reflected in the title Obenauf, meaning both “being in a good mood“ or rather “on top of“. The “head”, which is representative of the spirit, differs significantly from the lower body image. Both parts are independent from their second unequal half, however they are inseparably bound by their concept and can be associated with each other by textual and visual effects. 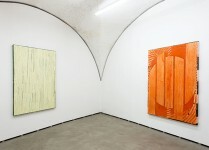 In Brörmann’s painted and spatial compositions, the linkage of large and small paintings is calculated. 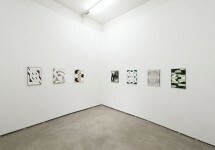 Here the canvases are shown not as dominant opponents, but as complex individuals with a double structure. The artist intuitively chooses shape, colour and texture and reveals thus the artistic action. Thereby the geometrical patterns that appear evident in the work Gotisches Bild, are put on and removed, revised and renewed by the help of various layers of paint. Through these artistic decisions, tensions of changing perception are produced and complex visual processes start. With these works Clara Brörmann questions how canvases among themselves communicate with and relate to each other. Like the Old Masters whose altarpieces consisted of several hierarchically arranged components, the artist pursues a multi-layered narrative structure, which extends from one stretcher to the next. And although the works by Clara Brörmann are categorically abstract, they are physical constitutions by the new compilation – on one hand through the composition and on the other hand with their tactile surface – that reveals the creative process. The viewer faces artworks that are painted installations and constructed portraits at the same time. How could reduced forms reflect their own materiality and how could abstract figures to be re-thought? 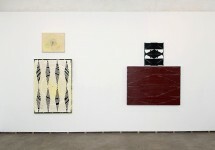 The exhibition also includes the two remarkable large-scale canvases Blinzelndes Bild (2013), Veranda (2014) and a complete series of eight paintings titled Von Vorne (2014) among others, where the artist plays with the beholder’s natural thirst for knowledge and offers insights into the intellectual and practical process of visual creation. The series’ title (“from the start“ or “from the surface“) reflects the artist's work ethic, which is to rethink and restructure works during her painting process, until she has created a unity of colour, form and material.